Last June, the New York State Senate passed an alarming bill that, had it also passed the state assembly, would have barred funding to student organizations engaged in “hate speech” or the promotion of boycotts of Israel or certain nations allied with the United States. That bill — S8017 — failed because it was passed at the tail end of the legislative session and did not clear the New York State Assembly. Today, however, the New York State Senate revived the bill — as S2493 — and passed it unchanged, renewing the possibility that the state of New York could be on a collision course with the First Amendment. 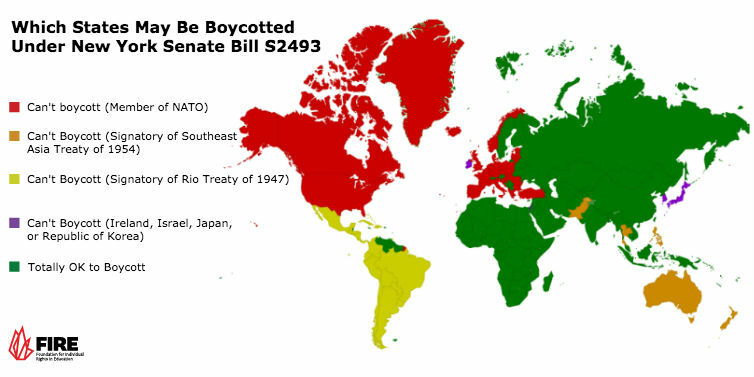 S2493 would bar state universities, city universities, and community colleges from funding any student organization that “promotes, encourages, or permits” boycotts against certain nations or permits “intolerance” or “hate speech.” The bill’s primary sponsor explained in a press release that the bill was in response to anti-Semitic incidents allegedly perpetrated by the student organization Students for Justice in Palestine, although independent investigators commissioned by the City University of New York system concluded in September that their “investigation does not support” calls to ban SJP from CUNY campuses. Worse, the definition of “boycott” is so vague that it would prohibit student organizations from calling on “any person” — including the President of the United States and other elected officials — to abstain from “political relations” with an allied nation. That means that if your student organization wants to call on Congress to reconsider its relationship with the state of Turkey, it will be ineligible for funding, because Turkey is a member of NATO. What if your organization thinks it was wrong for the United States to end its trade embargo against Cuba? Can you call on [President Trump] to reverse course? Cuba is a signatory to the Rio Treaty, but it was suspended during the Cold War. As we have said repeatedly in the past, the remedy for speech one dislikes is more speech. We hope lawmakers in the New York State Assembly agree and realize that pursuing this legislation is incompatible with America’s bedrock principle of free speech.